Stand collar with removable hood; zip front. Long sleeves; logo patch at left shoulder. Hidden zip pockets at waist. Moncler "Clavier" field jacket in weather-resistant solid weave. Stand collar with packaway hem; two-way zip front. Snap-adjustable barrel cuffs. Four flap pockets. Straight hem. Polyester; nylon trim. Made in Romania. Moncler "Marque" coat with dyed coyote fur (Canada) trim. Hooded neckline; two-way zip front. Long sleeves; snap cuffs. Side zip pockets. Flap pocket at left sleeve. Classic fit. Straight hem. Nylon. 90/10 down/feather fill. Imported. Moncler "Montclar" puffer jacket. Embroidered logo ribbon trim at hood and closure. Hooded neckline; two-way zip front. Front zip pockets. 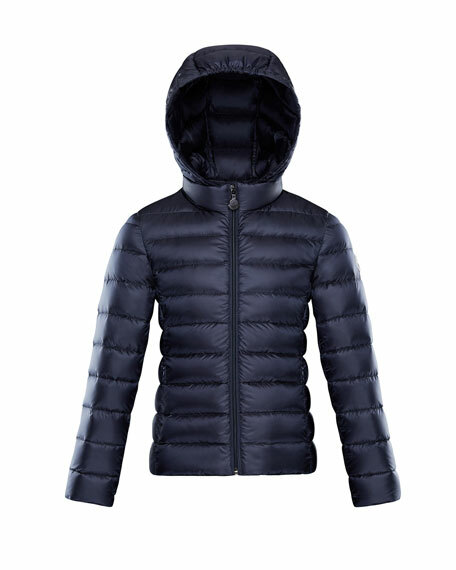 Moncler "Montclar" puffer jacket. Embroidered logo ribbon trim at hood and closure. Hooded neckline; two-way zip front. Front zip pockets. Logo patch at left sleeve. Nylon; combo polyester/cotton. Fill, 90/10 down/feathers. Made in Bulgaria. Model's measurements: Height, 6'1"/185cm, waist 31"/79cm, suit 40, shirt 15.5x35, inseam 32"/81cm.